The Sheffield Tap seemed like the ideal location to ponder the start of the 2017-18 football season. As the bar emptied and the volume subsided, my thoughts turned to what the new season might hold. I’ve got some interesting journeys to plan for, South Shields, Scarborough and Llandudno to name but a few, while no doubt the air miles will be clocked up with trips to Ireland and Holland taking place before the turn of the year. Plus of course, let’s not forget the surprises, the unplanned, and at times, the downright ridiculous. It wouldn’t be the same without it. But right now it was all about pre-season, and that in itself can be a less than straightforward experience. I like to plan my July fixtures around some of the new grounds that are dropping onto the radar for the season ahead, but several factors need to be considered. 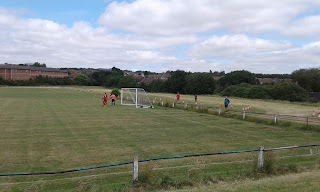 Firstly, where are the games being played, and that issue knocked two potential games on the head today when it came to light that neither GNP Seniors or Beeston Rylands were playing at their ‘normal’ grounds. Then of course games can be cancelled at very short notice (ground not ready / one of the teams can’t raise a side). 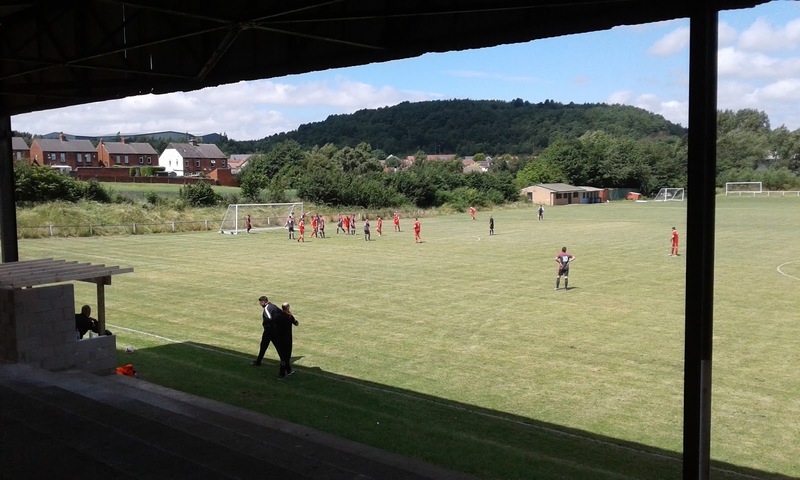 Finally, and this is one to watch very carefully, the kick off time can move, and that is exactly what happened with Dodworth Miners Welfare. To their credit, the Twitter updates were really helpful, no doubts as to where the game was being played, but then a couple of days ago the scheduled 3pm kick off became a 1pm kick off. I had always planned to go out on the train and have a few beers on the opening day, so it then meant a bit of careful planning to make sure two things could happen. Could I get to Dodworth for the game, but could I also arrive in time to sample a couple of lagers? The 10am train from Belper meant I could make a connection in Derby and subsequently be in the Tap by 11am. I was taken aback somewhat as to how busy it was, but then I’d not considered the pony factor across the way. The Tap isn’t cheap, but it’s very good, and the Czech Lager went down a treat, in fact both of them did, I had just enough time to imbibe before the Huddersfield bound train arrived to take me to the final destination. Dodworth sits right at the side of the M1, to the West of Barnsley, and is in fact the next stop after leaving Barnsley Interchange. As a village of around 5,500 inhabitants, it’s growing in terms of its profile. Being as close as it is to the motorway network, a quantity of new housing has sprung up and in turn property prices have risen sharply. Commerce and Industry has taken root in the area formerly dominated by the mining industry, and as a result, Dodworth has become a village of choice, with many non-locals choosing to reside in the area. But walking from the station into the centre of the village, it clearly still maintains its roots as a pit village. 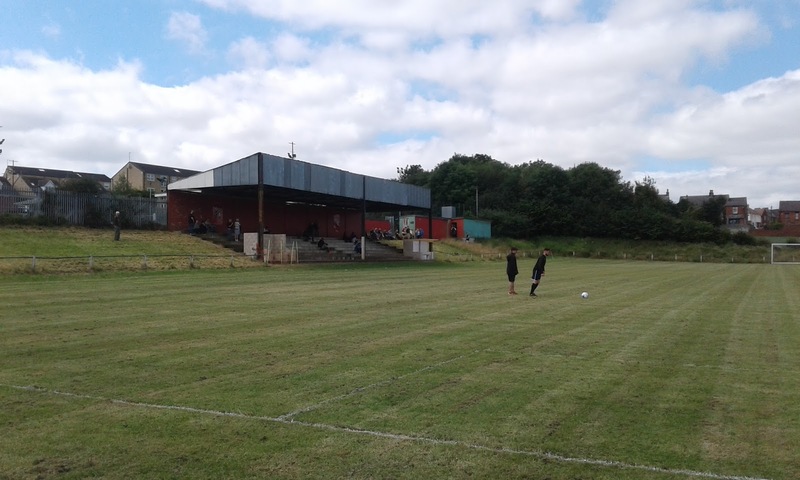 The Social Club and the Miners Welfare looked to be the only establishments open for a pint, and on the basis the football ground sat behind the Welfare, it seemed the natural choice to rest for a short while. Sensibly priced beer, served in glass or plastic depending on your intentions, with a wonderfully warm welcome, the ‘Tappers’ as it’s known locally, was a busy venue, but time was tight, the game was due to get underway, and let’s not forget, that’s the real reason we are here today, right? What a gem! The ground is a real blast from the past, a large covered area of terracing sat on the Welfare side built into a large natural bank. It’s the type of cover that can often been seen at Miners Welfare grounds, and I think about the likes of South Kirby, Kiveton Park, Bentley and Woolley. For a Step 8 (Step 9 last season), it’s a real cracker. 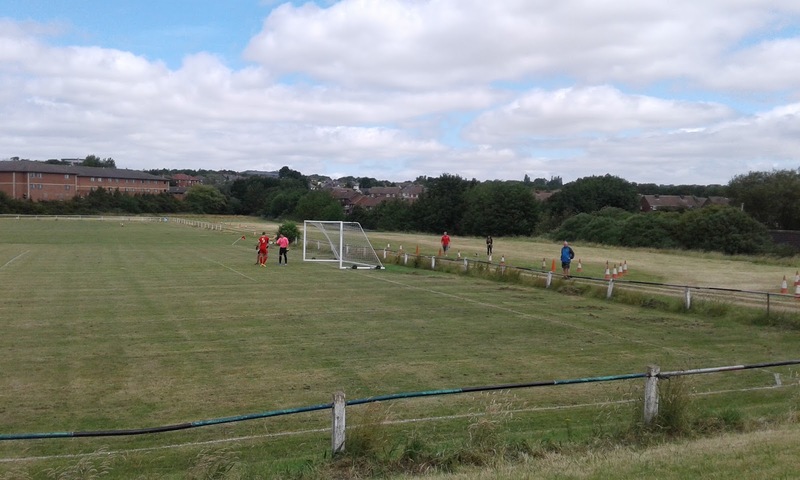 The ground is railed on three sides, but its set into a vast expanse of grass, with plenty of room for a second pitch on the far side. Looking out on the far side the 'Muck Stack' is clearly visible, the former spoil heap from the mining days has now been landscaped and turned into a green haven. A decent crowd gathered on a glorious day, including one or two from the travelling fraternity, some of whom had travelled huge distances (Southampton for one). I decided to sit on the grass bank with my plastic, and watch the new campaign begin in earnest. Dodworth were the better side throughout the game, taking the lead just before half time, and then scoring three more times in the second period against a much changed visiting team. 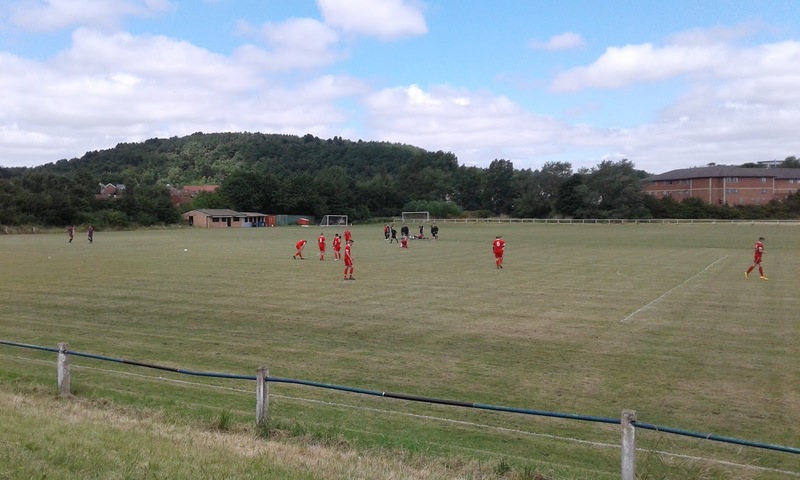 I don’t read too much into pre-season results and performances, but suffice to say, despite being two divisions below the visitors, Dodworth looked like a side with confidence and no little ability. It could be a good season once again after gaining promotion at the end of the last campaign. Step 7 football would be befitting of the club and indeed the venue. 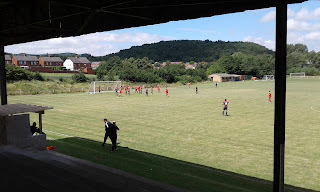 The final whistle arrived bang on ninety minutes and that gave me just enough time to make the connection back to Sheffield. I had time for one more in the Tap, it was very quiet for a Saturday afternoon, but then I guess it will be somewhat different when the trains return from Donny. Football’s back, and what a great place to start.